The Hundertwasser building of Luther-Melanchton-Gymnasium was built as a plain new building (type: Erfurt II) and has been a boring monstrosity since then. But at the beginning of the nineties several students thought in their art lessons about how to improve its outward appearance. Consequently a lot of ideas came into being which were oriented to the type of construction of Friedensreich Hundertwasser (well-known for Hundertwasserhaus in the capital of Austria). A letter was written and sent to Vienna. Therefore Hundertwasser decided to participate in the project. Since 29th May 1999 the (according to Hundertwasser's plans) restaurated building is complete and is admired by numerous tourists from all over the world. With several innovations the LMG in Wittenberg is one of the most modern schools in Europe. Since 2000 there are about 65 PCs in many cabinets which are linked by an internal PCs network and have free access to the Internet. Every student can use them in order to improve technical skills or just to have fun. As well as two new computer cabinets there is the media project workshop where you can work on films digitally. Also, the renewed hall in the center of the school is a meeting place for performance or important announcements to the students. 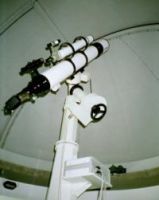 With the help of the observatory the astronomy class becomes easily comprehensible and close to reality. Therefore the students are able to reach for the stars. In the new established cabinets (chemistry, physics) with high security standarts and access to the computer network students and teachers have new possibilities for doing projects and getting current scientific information.